The Artist and Empire exhibition which opened 23 November 2015 at Tate Britain is a long overdue show that aims to square aesthetics with a reckoning with Britain’s imperial past. This is a tall order, and the gallery has been lauded by the press for taking this on. But should this not be its very remit, certainly since the rebranding of the Millbank site as Tate Britain in 2000? So why credit the institution with putting on a show that one would and should expect? After all, the empire is central to British history and has garnered considerable public attention since its demise. We have for example had the Raj nostalgia of the 1980s, and the flourishing of postcolonial theory in the 1980s and 1990s, which shone a spotlight on issues of empire, instigating deep debates. So how can it be that as late as 2015 this exhibition can lay claim to being a first and to get applauded for doing so at all, whatever its limitations may be? Tate Britain acknowledges the exhibition’s belatedness. In its defence, it points to the conference ‘Art and the British Empire’ held at Tate Britain in 2001 so as to spotlight exhibitions such as 1807: Blake, Slavery and the Radical Mind in 2007, the Lure of the East in 2008, the more recent show Migrations, Journeys into British Art in 2012 and the focus display Thin Black Line(s) also in 2012, curated by Lubaina Himid. Most of these are small spotlight shows however and Lure of the East can hardly be called a critical assessment of imperial legacies. Let us now turn to how Tate Britain has opted to address this art historical omission and how it proposes to square the circle of ‘art and empire’. The exhibition is organised in six themes and each theme is allocated a room. The first room is dedicated to maps. It highlights the roots of empire in trade, exploration and military conquest, and spells out how central map making, topographies and picturing were to the work of empire. Maps of course are always an invention based on the conditions that prevail at any given point in time. In a colonial setting they are also a double act that erases indigenous geographies while imposing new spellings, names and borders. They are ultimately about visualising space according to a preferred narrative, which however, as Walter Crane’s 1886 map of the British Empire displayed demonstrates, does not always represent a dominant view. This map was reproduced as a large colour supplement in The Graphic to mark the Colonial and Indian Exhibition held in London at the time. It however promotes a federated vision of empire as alternative to colonial imperialism. This is mainly argued through Crane’s border decorations that include allegorical figures of freedom, fraternity and federation clad with Phrygian caps. And while Crane clearly shows representatives of the colonial power such as a white soldier, a settler and a sailor, he also shows an Indian porter weighed down by his burden as well as other indigenous figures that stand proud. Crane adapted these border decorations from a prominent map published for the 1886 exhibition, and it would have been helpful to have this map in the room to compare and grasp the full import of Crane’s additions. In tandem they would also have spelled out very poignantly that the British Empire was contested even at its peak. The second room is themed ‘Trophies of Empire’ and refers to the centrality of a widely conceived notion of collecting for the imperial enterprise, ranging from looting to appropriation, but also classification and knowledge production about the peoples and cultures subsumed under the British banner. The chosen theme is somewhat unfortunate however in that it emphasises material acquisition over the equally, if not more fundamental and entrenching processes of colonial knowledge gathering and the conceptual framing and ossification of aspects of India’s indigenous cultures, such as the caste system and religious affiliation. Yet this is still a remarkable and rich room. It presents the curiosity of encounter on a vernacular scale and offers multiple well-selected examples of works that speak eloquently of two-way cultural appropriations not achieved in the other rooms. This in part has to do with size. With the exception of some spectacular paintings on a grand scale, such as Stubbs’ A Cheetah and a Stag with Indian Attendants (c 1764, Manchester City Gallery), the images here are on a more intimate scale and do not seek to impress but invite detailed, close observation.8 This room also allows a glimpse of the largely untold story of amateur art in the colonies, such as botanical drawings by Anna Maria (Lady) Jones (1785) which are juxtaposed with an equally sumptuous example of a botanical work by the Indian artist Shaik Zain-ud-Din (1782), considered a Company School painter, both loaned by the Royal Asiatic Society. It also presents Hodges’ Tomb and Distant Views of the Rajmahal Hills (c 1782) alongside the drawing Façade of the Palace of the Rajas of Tanjore, Tanjore, Madras (c 1830) by an anonymous South Indian artist that presents an eclectic mix of Indian and European architectural styles, Linneaus Tripe’s photograph of the so-called Elliot marbles, that is Buddhist sculptures removed from the Grand Stupa at Amaravati in South-Eastern India and named after their excavator Sir Walter Elliot, and Marianne North’s sketch of one the Ajanta caves (1878). A truly inspired curatorial arrangement that engages the viewer. However, some contextual information might well have facilitated the juxtaposition’s intended eloquence. This brings us to several difficulties the curators faced when planning the show. The institutional remit is to uphold the highest standards of what is deemed to be art. Visual references to popular culture and the fascinating interface of fine art, imperial reportage and mass image production, eloquently made in the exhibition catalogue, are therefore absent in the show and leave a large and central part of the story of ‘artist and empire’ untold. This omission is heighted by a further constraint the curators laboured under: information panels are limited to 100 words per objects if presented on the wall, and 50 words when placed in display cases. This most unfortunate limitation invokes the spectre of formalism and the entrenched but misguided belief that works of art speak for themselves. Yet as has long been accepted the interpretation of images requires a grasp of cultural codes, embedded in the work, acquired through education and/or participation in requisite cultural worlds. Images therefore do not speak a universal cultural language but always a specific one that needs to be made accessible, especially when they culturally or historically come from outside the cultural sphere of the viewer. The next two rooms themed ‘Power Dressing’ (Room Four) and ‘Face to Face’ (Room Five) are more or less focused on portraits, full-length or more intimate, and demonstrate a remarkable fondness by British officials for cultural cross-dressing. This is of interest as a counterpoint to the fact that postcolonial theory underscores the propensity of colonised peoples to mimic colonisers.11 Room Four demonstrates that mimicry played out in both directions, albeit under different parameters. Here real opportunities were missed to examine these relations. Room Five for example shows a caricature of a colonial ‘mimic man’ or bhadralok as Indians who had adopted a Western habitus were called in the Bengali vernacular at the time. This image could well have served as a counterpoint – however, only partially, as this image is small in scale and the grand manner portraits of men in oriental garb are positively cyclopean in comparison – to the many examples of grand British cultural cross-dressers in Room Four, opening up a debate about the contexts for such changes in attire, and how to understand them. Here it must also be noted that not all cultural cross dressing is made equal. This again speaks to the need to address cultural specificities and to provide further information. There were, for example, two modes of adopting Indian garb. Joshua Reynolds’s grand portrait, Captain John Foote in Mughal Dress (1761–1765) speaks of the language of uniform and sartorial signification as Foote acquires the power of the dominant colonial subject through his appropriation of Mughal dress. This anticipated the self-styling of the Raj who adopted the Mughal mode of holding court called ‘durbar’ to present themselves as successors to the power in the land when the East India Company first set foot in India, most spectacularly so in the famous 1911 Delhi Durbar attended by George V. But there was also a more domestic mode of adopting Indian dress that was accompanied by an, at least partial, embrace of Indian styles of living. This was in evidence mainly in the late eighteenth and first half of the nineteenth century and often entailed British men marrying Indian women. 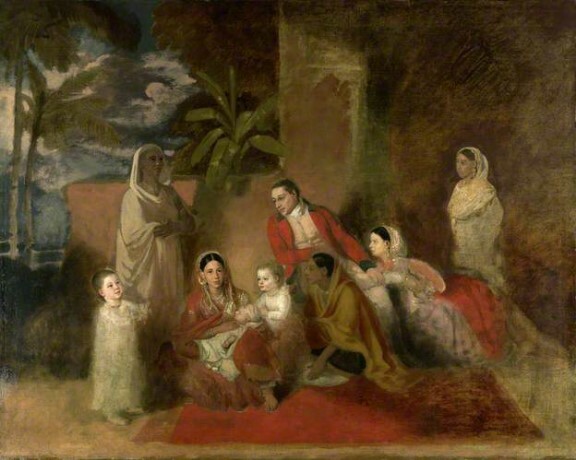 The British Library’s (unfinished) painting attributed to Johann Zoffany, which portrays Major William Palmer affectionately looking at his Indian princess wife and their children for example, might potentially speak to a more familial mode of responding to indigenous ways.12 Or the watercolour, most likely portraying Sir David Ochterlony, another Company official, in Indian dress, smoking a hookah and watching a nautch (popular dance) being performed at his house in Delhi, (c 1820), also held at the British Library.13 If these images had been included it would have offered a counter balance to the decontextualised Orientalist posturing in borrowed plumes that dominates this room. 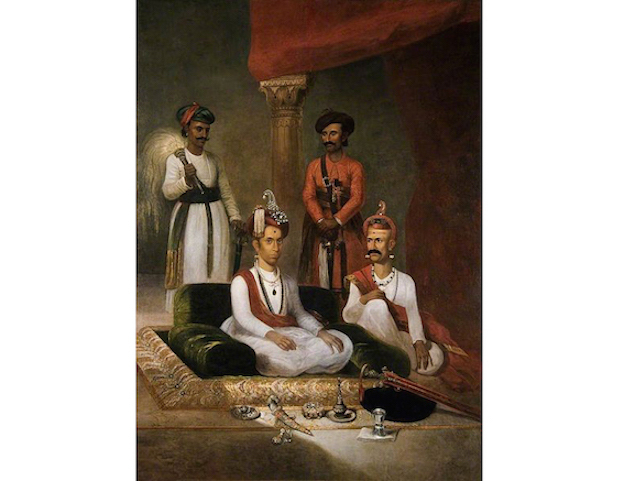 A further point easily missed in the exhibition but documented in the catalogue is the introduction of portraiture by Warren Hastings, India’s first Governor-General, to the politics of the Indo-British encounter. In an effort to reduce corruption in the East India Company he encouraged native princes and rulers to replace the valuable gifts exchanged during traditional Mughal gift giving ceremonies – in which company officials partook and often pocketed the gifts – with the exchange of portraits. Indian rulers were therefore expected to have their portraits painted in a European manner. This constituted a novel departure for Indian culture and also provided lucrative commissions for European artists who had ventured to India in search of opportunities. More often than not this new ceremonial etiquette revealed itself as a one-sided exchange as Indian princes frequently did not receive a portrait in return, which turned their gift effectively into a tribute.14 The awkwardness and unease that characterised this uneven exchange is tangible in the portrait of Madhav Rao Narayan, the Maratha Peshwa by James Wales (1792) which was finished by the Daniells some years after Wales’s death.15 Yet it was not only the sitters who were ill at ease. According to the artist this was a difficult commission as the peshwa (equivalent of Prime Minister) imposed many conditions, such as the work’s blend of Mughal style miniature painting with European illusionism and the adoption of a history painting format. This image therefore represents an important moment in the history of visual exchange between Britain and India which could well have been highlighted in the exhibition and drawn out as a sub-theme. This touches on another omission, in part at least, that affects the exhibition's scope: the quasi erasure of company painting through selecting images that do not make its hybrid nature evident. The botanical drawing by Shaik Zain-ud-Din, already mentioned, is, for example, hardly distinct from the drawing by Lady Jones it is juxtaposed with. And while this does make the welcome point about the equal ability of Indian artists, on the other hand does not allow the gallery visitor to become acquainted with this very significant school of art that evolved through the colonial encounter in British India. The inclusion of some salient examples of this school showing Indian topography and prominent sites would also have been beneficial, and would for example have been well suited to the theme of Room One. The inclusion of such examples would also have facilitated the development of a mental trajectory of the Indian visual response to Britain’s colonial presence and aesthetic interventions, and offered a point of transition to what comes across as the sudden appearance of modern and contemporary Indian art, seemingly out of the blue, in the last room (Room Six). In fact it would appear that the work by Indian artists is ‘slipped in on the quiet’ in the first five rooms of the show. One way to read this is to suggest that it flags up the prevailing impact of a mental separation between British art and empire already mentioned. Is this where Tate Britain trips itself up one wonders, by upholding notions of aesthetic value and of British art that have long been expanded in contemporary settings, barring what might be conceived of as the artistically ‘inferior’ hybrid work of the Company School? To the curators’ credit the portrait of a houseboy by Manchershaw Pithawalla (1898) is for example included in Room Five. Pithawalla was so successful that he was given a one-man show in the Doré Gallery in London in 1911, the first Indian artist to do so. 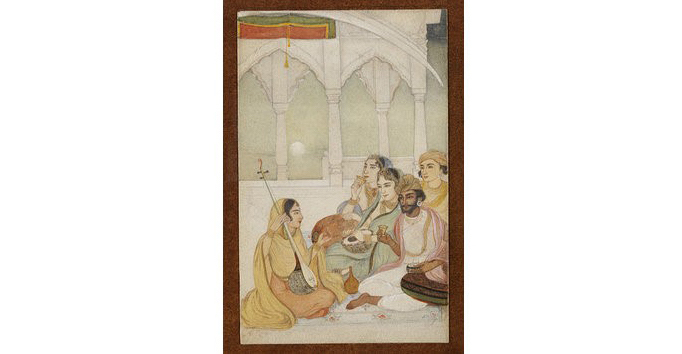 It is hung next to Abanindranath Tagore’s watercolour A Music Party (c 1905). The juxtaposition of these two works speaks volumes about the difference between Indian artists who come through the government art school system and adopt academic, art and those who seek alternatives to colonial aesthetics.16 This important work can be read as being representative of the Bengal Renaissance – the Indian art movement that broke with British art and aligned itself with the struggle for nationalism and self-governance (swadeshi) and which sought to forge a modern, national Indian art style by mining past Indian artistic practices. Again, it is a shame that this seminal watercolour is not foregrounded more in the display or drawn attention to in an information panel: its presentation feels more like a token gesture towards the formative period of Indian modernity and its relationship to artistic practice. This brings us to yet another area of concern. Whereas the first five rooms of the exhibition adopt a purposefully synchronic perspective that avoids geographical foci or chronological perspectives, Room Six, the last room of the exhibition, breaks this pattern, adopting a chronological theme. Exhibition visitors move from ‘Mapping and Marking’, to ‘Trophies of Empire’, ‘Imperial Heroics’, ‘Power Dressing’ and ‘Face to Face’ to arrive at the final room double-themed ‘Out of Empire’ and ‘Legacies of Empire’ respectively. This double room attempts to articulate the increasing aesthetic emancipation of former colonies from colonial tutelage and ‘positively’ leaps through the struggle for Independence to arrive at an equally compressed presentation of art in the time of the postcolony. Such questionable, extreme compression however is not the main issue, nor the adoption of a chronological perspective per se. What is troubling is that the curation rehearses the very split between art and empire already mentioned, as works by artists from former colonies are crammed into a small space. The works furthermore are not arranged in a geographically specific manner, and the differences and specificities of the struggle with, and responses to, colonial contexts are hence obscured. This last room therefore presents itself as a truncated after-thought rather than an integral part of the exhibition. This impression is further heightened by a missing transition in the ‘Out of Empire’, the first section of this room, representative of the period when artists like Pithawalla who had adopted a colonial style of art were celebrated as great Indian artists by the British and the educated Indian elite alike (who however is not presented in this room). The éminence grise missing here is Ravi Varma, the first Indian artist to paint in oils and willing to engage with Western academic illusionism as taught and promoted by such institutions as the Royal Academy. He was championed by the British and Indian elites alike as the product of the British colonial process that proved to the world that the colonial civilising project had worked, as Indian culture now, at long last, had progressed from design to fully-fledged fine art. And while his fame only lasted until the arrival of Abanindranath Tagore on the artistic scene, his work nonetheless marks an important milestone the exhibition would have done well to present. Tate Britain is following well-trodden paths with this omission. Firstly there is the impact of the already cited, long-established conceptual separation between Britain and its empire that dominated the fields of British history and art history and impoverished and misrepresented the history of British art. The second aspect here is the fact that colonial nationalists were just as uneasy about this period of Indian art produced in a Western academic idiom. Pushing for self-rule, self-economy, non-co-operation, non-violence and/or Independence, Indian nationalists sought to distance themselves from this art that they came to consider a shameful history of adopting the aesthetic language of the coloniser. Indian histories of the rise of modern Indian art therefore tended to concentrate on the period just after this phase of what one might refer to as an Indian academic art. But by following this trend, and by eclipsing this earlier period marked by British intervention in Indian arts through art schools and the steering of Indian artisanal practices, an important history of the British arts of empire remains untold. This is even more surprising as the work of Pithawalla and Abanindranath Tagore that could relate this history is actually included in Room Five of the exhibition, but its presentation does not allow for the significance of the work to be made evident. ‘Out of Empire’ however, even if patchy and ultra-condensed, does assemble a unique juxtaposition of three copies of Buddhist murals from the Ajanta caves that potentially bring alive an aspect of the legacy of British artistic intervention in India. 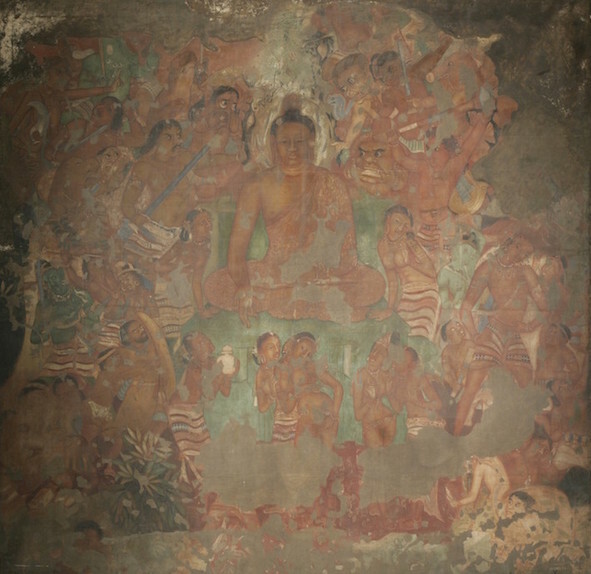 The Buddhist caves had been rediscovered in 1819 by the British and in 1844 the British government sponsored a project to copy the frescos. Twenty-seven facsimiles in oil were subsequently shipped to London. These works were initially installed in the East India Company’s museum but then shown at the Great Exhibition and then Crystal Palace in Sydenham where they went up in flames in 1866 when the venue burned down. In 1872 a new team led by John Griffiths, the Superintendent of the Bombay art school, was commissioned to copy the frescos all over again, and who invited some of his Indian students to participate in the project. The murals were now also taken up by Indian nationalists who championed them as a highpoint of a past golden age of Indian art, declaring them a basis for a new national Indian art. As part of this invention of a new cultural tradition a direct line of descent was declared from Buddhist art to Bengal folk art such as Kalighat paintings which subsequently inspired the work of Jamini Roy (also shown in this room). Mughal art was also drawn into this equation and argued as expressive of an Indian national spirit that had transformed Mughal art’s foundational Persian elements into a uniquely Indian art form. An interpretation of Ajanta’s murals combined with other elements such as Mughal art and some references to European illusionism, for example, informed the art of the Bengali Renaissance represented by the work Abanindranath Tagore, and numerous Indian artists also copied the frescos in search for an authentically Indian style of art. A fair number of them took part in yet another team of copyists that ventured to the caves, this time under the leadership of Christiana Herringham, a British artist and art patron with an interest in art conservation. Her watercolour copy of a fragment in cave seventeen displayed alongside Griffith’s earlier copy demonstrate a shift in evaluation of the frescoes. Griffiths’ interest in the murals had evolved from his interest in decoration and his approach was mainly documentary. Herringham, however, was a member of the India Society that had been formed in London in 1910 to promote Indian art. The Society sought to counter entrenched racial ideas, such as that there was no true art in India as Indians supposedly were not sufficiently evolved to bring forth artistic genius. Her project was therefore less focused on documentation and rather sought to foreground the artistic spirit of the work and her piece is more evocative than Griffith’s. The third Ajanta sketch is by ‘India’s Frida Kahlo’: the Indo-Hungarian artist Amrita Sher-Gil. It represents a further phase in the development of Indian art characterised by a turn towards European modern art. Sher-Gil found inspiration for an Indian approach to the simplification of forms in the Ajanta murals and she saw these studies as a suitable Indian parallel to the work of Gauguin which she had seen and admired while studying art in Paris. The co-presentation of these three works therefore successfully references three major moments in the history of art and empire in British India that might however have been flagged up more so viewers could appreciate their significance. The second part of Room Six ‘Legacies of Empire’ has set itself an even more impossible task. It offers an uneven time lapse through an eclectic selection of works that cannot do justice to the import of the theme. Yet again more information would have been helpful. And the fact that this room farms out dealing with the colonial legacy to the former colonised is highly problematic. A crucial opportunity has therefore been missed as this segregation rehearses and reinforces the very Britain-and-Empire split which the concept of British art suffers from and the exhibition ostensibly is seeking to redress. And there are further questions. As far as India’s post-Independence story is concerned one wonders why the Singh Twins were selected to stand in for this period. In fact one could argue this choice as quite problematic, as it suggests postcolonial Indian art is wedded to what could be seen as an ‘indigenous’ mode of painting. This choice also rehearses the double standard Indian artists who opted to work in modern styles were subjected to: they were called derivative for employing such styles and were pushed to use Indian visual idioms deemed ‘authentic’, while European artists concerned with what we can loosely term ‘primitivism’ freely appropriated visual forms from around the globe without ever being subjected to the charge of inauthenticity. A further observation is that the art in this last room would have had much greater impact if it had been distributed throughout the earlier rooms in dialogue with the spectacular work of early and high imperialism on show. This juxtaposition would have opened up the issue of art and empire, and prompted debate. It would also have offered an inherent reflexivity that the one contemporary piece by Tony Phillips in Room Three just cannot deliver. This might also have drawn out other issues to do with ‘facing the legacy’ of the British Empire that have not been addressed by the exhibition, such as the scientific racism prevalent in the latter half of the nineteenth century. It might also have offered the opportunity to introduce institutional self-reflexivity by pointing, for example, to the links between sugar production and Henry Tate’s fortune which was used to found Tate Britain. 4 See https://www.royalcollection.org.uk/collection/403826/bakshiram. The portraits are usually displayed in the corridor leading to the Durbar Hall in Osborne House on the Isle of Wight depicted. They depict ‘artisans’ that were on show working at their crafts in the 1886 Indian and Colonial Exhibition in London, except they were actually prisoners from Agra jail trained in their craft in prison and shipped out to London with their prison guards. See Saloni Mathur, ‘“To Visit the Queen”: On Display at the Colonial and Indian Exhibition of 1886’, in Saloni Mathur, ed, India by Design: Colonial History and Cultural Display, University of California Press, Berkeley, 2007, pp 52–80. 6 This was highlighted in the publication that came out of the 2001 conference ‘Art and Empire’ held at Tate Britain. See Timothy Barringer, Geoff Quilley, and Douglas Fordham, Art and the British Empire, Manchester University Press, Manchester, 2007. 7 See Alison Smith, ‘Introduction’, in Alison Smith, David Blaney Brown and Carol Jacobi, eds, Artist and Empire, Tate Publishing, London, 2014. 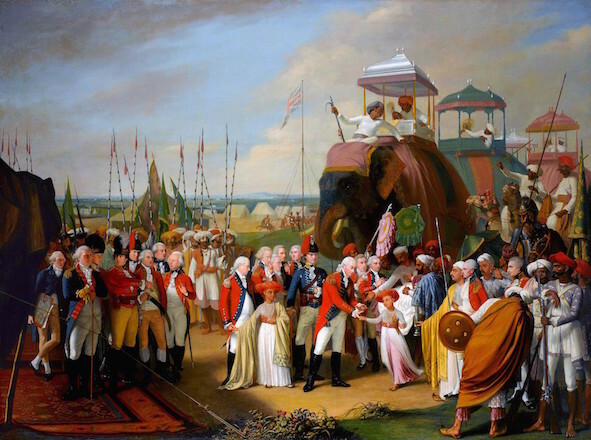 14 See Natasha Eaton, ‘Between Mimesis and Alterity: Art, Gift, and Diplomacy in Colonial India, 1770–1800’, Comparative Studies in Society and History, vol 46, no 4, 2004. Dr Renate Dohmen is a lecturer in Modern and Contemporary Art at The Open University.